Discovery light curve for KELT-18b based on 4162 observation from the KELT-North telescope. The data have been phase-folded on the preliminary value for the period, 2.8716482d. Credit: McLeod et al., 2017. (Phys.org)—Using the Kilodegree Extremely Little Telescope (KELT) astronomers have detected a new gas giant alien world. The newly discovered exoplanet, designated KELT-18b, turns out to be a highly inflated "hot Jupiter" orbiting a bright, hot star. The findings were presented in a paper published Feb. 6 on the arXiv pre-print server. KELT consists of two telescopes, KELT-North located in Arizona and KELT-South at the SAAO observing station near Sutherland in South Africa. A team of researchers led by Kim McLeod of the Wellesley College in Wellesley, Massachusetts, used KELT-North to observe KELT-18 (also known as BD+60 1538 or TYC 3865-1173-1) as a candidate host star of a transiting planet. 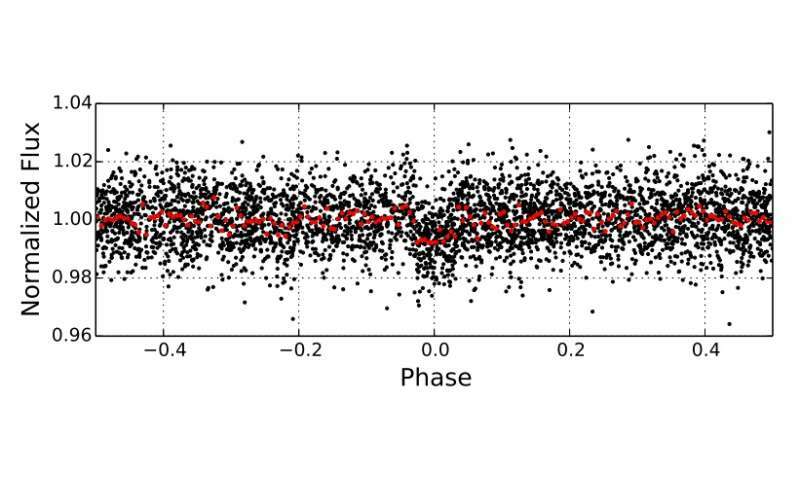 Light curves of KELT-18 obtained by KELT-North allowed the team to distinguish a transit signal. The planetary nature of this signal was later confirmed by follow-up photometric and spectroscopic observations utilizing a network of observatories around the world. Moreover, the researchers also derived the fundamental parameters of the newly found planetary system. "We report the discovery of KELT-18b, a transiting hot Jupiter in a 2.87d orbit around the bright (V= 10.1), hot, F4V star BD+60 1538 (TYC 3865-1173-1). We present follow-up photometry, spectroscopy, and adaptive optics imaging that allow a detailed characterization of the system," the paper reads. KELT-18b was found to be about 18 percent more massive than Jupiter, though it has a radius of approximately 1.57 Jupiter radii. Therefore, the planet is larger than it should be when compared to typical gas giants. Thus, KELT-18b was classified as a highly inflated gaseous world. Such inflated planets are still a mystery for the scientific community as the cause of the inflation process is widely debated. It could be due to tidal heating, kinetic heating, enhanced atmospheric opacities or ohmic dissipation. With an orbital period of about 2.9 days, KELT-18b belongs to the hot Jupiter family of planets. The so-called hot Jupiters are gas giant planets, similar in characteristics to the solar system's biggest planet, with orbital periods of less than 10 days. They have high surface temperatures as they orbit their host stars very closely. According to the paper, KELT-18b is one of the most inflated planets known orbiting a hot star. It also joins the group of very low density (about 0.38 g cm-3), highly inflated planets transiting hot hosts. "KELT-18b is one of least dense planets known among those with hot, bright hosts. It provides a check on the empirical relations for radius inflation in a part of parameter space that is still only sparsely sampled," the researchers noted. The scientists also noted that the host star KELT-18 (1.52 solar masses and 1.98 solar radii) could have a stellar companion at a distance of about 1,100 AU, which may have contributed to the strong misalignment suspected between KELT-18's spin axis and the planet's orbital axis. "We encourage Rossiter-McLaughlin measurements in the near future to confirm the suspected spin-orbit misalignment of this system," the team concluded. We report the discovery of KELT-18b, a transiting hot Jupiter in a 2.87d orbit around the bright (V=10.1), hot, F4V star BD+60 1538 (TYC 3865-1173-1). We present follow-up photometry, spectroscopy, and adaptive optics imaging that allow a detailed characterization of the system. Our preferred model fits yield a host stellar temperature of 6670+/-120 K and a mass of 1.524+/-0.069 Msun, situating it as one of only a handful of known transiting planets with hosts that are as hot, massive, and bright. The planet has a mass of 1.18+/-0.11 Mjup, a radius of 1.57+/-0.04 Rjup, and a density of 0.377+/-0.040 g/cm^3, making it one of the most inflated planets known around a hot star. We argue that KELT-18b's high temperature, low surface gravity, and hot, bright host make it an excellent candidate for observations aimed at atmospheric characterization. We also present evidence for a bound stellar companion at a projected separation of ~1100 AU, and speculate that it may have contributed to the strong misalignment we suspect between KELT-18's spin axis and its planet's orbital axis. The inferior conjunction time is 2457542.524998 +/-0.000416 (BJD_TDB) and the orbital period is 2.8717510 +/- 0.0000029 days. We encourage Rossiter-McLaughlin measurements in the near future to confirm the suspected spin-orbit misalignment of this system. Are the red points calculated by the average of some range of points surrounding each position or is there some other method? I've been trying to find out but the methods they use seem to be specific to calculating periods and other things. I have very similar looking data points but they are produced from the alignment of DNA binding positions. I use other analysis methods but this analysis looks exactly like what I need. Are the red points calculated by the average of some range of points surrounding each position...?